It can be fun and interesting to catch wild moths to see the beautiful variety in colors, shapes and sizes. Especially in tropical countries the species of wild moths are amazing and very variable, but also in more northern latitudes like in Europe and North America you can find amazing species. Catching wild moths should always be done only to observe or photograph them. You should not take wild moths from nature to keep them in a cage at home. Please conserve nature by admiring it without damaging it. If you want to keep moths as pets, please raise native caterpillar species and release the adult moths. 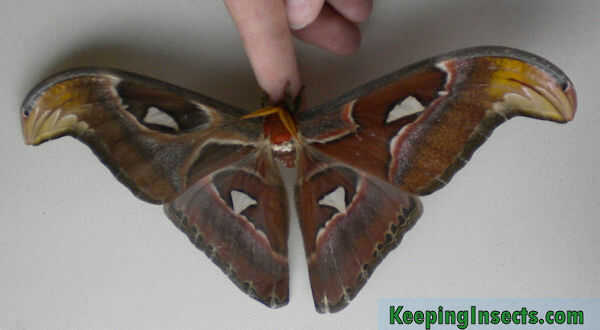 Do not release moths that do not naturally occur in your country. Moths can be caught easily by light trapping them at night. This method will work in summer and end of spring nights, or year round in tropical countries. Moths are attracted to light, so by creating a bright light source in an area where moths occur you will attract them. Especially male moths fly a lot at night, so they are easily caught with this method. For light trapping you will need a strong and bright white light, a big white sheet or cloth and a way to hang the sheet outdoors. The best sheets are not that thick, very white and at least the size of a sheet for a single bed. You need to hang the sheet in an area without too much man-made lights and with plenty of nature around it. The location of the sheet, the hour of the night and the weather will greatly influence the success of the trapping, so please try a few different locations on different nights to find out where you can find the most amazing moths in your area. Hang the white sheet in the nature area and direct the bright white light straight at it. The light will illuminate the white sheet completely. Now it’s time to wait! The moths will be attracted to the light and will land on the sheet. On this sheet you can study them and photograph them. Do not touch them with your hands as this damages the scales on the wings. Please note that there are more ways of light trapping then using a sheet. I only describe this way of light trapping, because it is least damaging to the moths. Actually it is not really a trapping method, as the moths are not trapped but just attracted. Real trapping methods can kill moths, for example if the moths are attracted to a light inside a white bucket. The moth catcher does not have to stay up at night or observe the sheet, which makes it easy to catch big quantities of moths but will damage or kill many of the catches. For insect enthusiasts, children and moth fans it is much better and more fun to catch moths using the sheet. While you are catching moths by light trapping you can also get some interesting other finds! Many other bugs also are attracted by light. If you live in a country with praying mantises, you will be able to find male praying mantises on the sheet. If you live in a country with stick insects or leaf insects, you could catch flying males of these species. You can also find mosquitoes, beetles, true bugs and almost all other night-flying insects on the sheet. 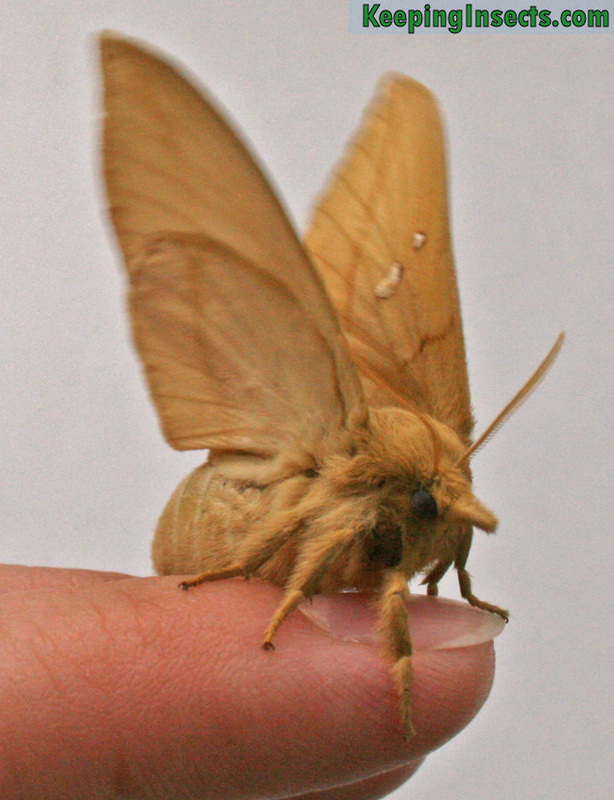 If you catch a female moth that is ready to reproduce, you could also observe the males that are attracted to her. If she is ready to mate she can release pheromones that can be sensed by the males of her species. They will be attracted to her and mate with her. It’s fun and interesting to observe this natural behavior! There is no easy way to catch wild caterpillars. The only thing you can do is observe closely, visit a lot of natural areas and inspect plants that show signs of being eaten. If you are looking for a specific species of butterfly or moth you should first located the food plant. Check this plant for caterpillars, both on top of the leaves and under the leaves of the plant. Make sure you are looking for caterpillars at the appropriate time of year! In temperate zones most caterpillars can be found in spring, some other species exclusively in a few weeks in summer or fall. Tropical species can occur any time of year, but every species has a peak period in which it can be found. Outside this period it is impossible or rare to find specimens of this species. What if you have caught a beautiful moth using the sheet light trapping method, but you don’t know the species? Next to searching online for descriptions or pictures you could also send a picture to me at the contact page. I will try to determine the species for you! Please also send information about the catching location and catch date.